Christie’s International Real Estate Magazine is your quarterly guide to premium property for sale around the world it also gives you a guide to some of the world’s most luxurious hotels and countries to live in. 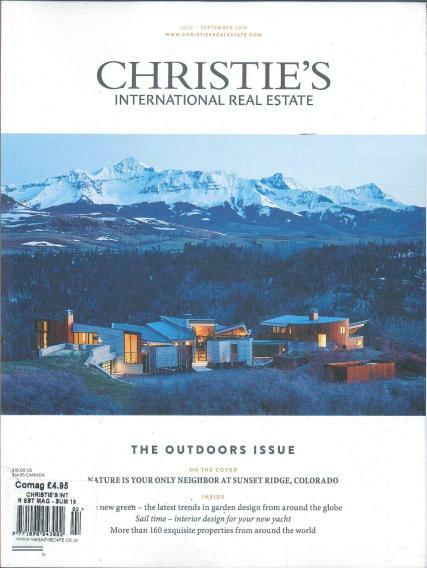 Buy a single copy or subscription to Christie’s International Real Estate magazine. It is an international magazine which showcases distinctive properties from around the world. For many, real estate represents a sense of place and permanence. It is a place where friends and family congregate, share good times, and participate in meaningful gatherings. Perhaps this is one of the reasons why, in these unsettling times, the acquisition of a home takes on an even greater importance than many other investments. The magazine features the world's most extraordinary properties offered for sale. The real estate companies affiliated with this magazine invite reader inquiries about the homes they feature and other fine homes they represent.